The undead hordes are back! But this time they're not miniatures shambling around a modular board - the zombies are coming straight for you! As in most zombie games, you represent a unique character with your own character traits, except in Run, Fight, or Die! you will also have your own individual board with zombies you alone will encounter. Zombies move closer to you every round. You run from location to location, searching for weapons and survivors in a desperate attempt to stay alive. Survivors may bring new skills to help you in your desperate fight for survival, or in some cases, new challenges to overcome. In either case, every survivor provides you victory points. 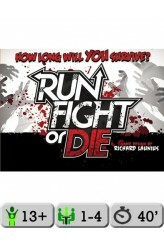 The game ends either when one player finds five survivors and declares the last round, or when a player reaches the ..